Our Jungle Crows Foundation (JCF) and its new love “Netball” have just finished the first week of very intense coaching and held a super eight team tournament in the ‘City of Joy’ Kolkata. We had more than two hundred kids taking part as players and spectators. Monica and Daxa from Netball Development Trust were in town for the week and worked non-stop to train up ten JCF Khelo Netball Coaches and support the delivery of a new and very fun game. Netball fits perfectly with the values and ideas of JCF which is equal opportunity for both boys and girls to play and participate on one level field and importantly to enjoy a normal childhood which includes sport and games. As an organisation we believe that every child should have a healthy childhood, both physically and mentally, and we think sport is one of the best ways to promote this. Parweez tell us something about your first week of learning and coaching Netball? Yes it was a great week, Netball is a good game for both boys and girls. I do not think we found it difficult to understand. 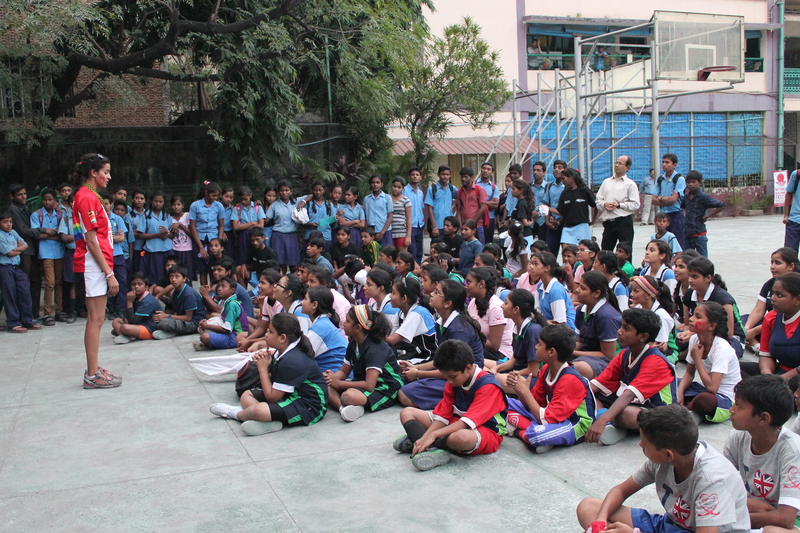 We had 8 teams participating in the tournament which was held at St Joseph’s school ground. It was great to see so many children playing the sport with only 4 days practice. During tournament day they played like they had been playing the sport for years. So what next now ? We are now in Siliguri and we will be working on the same model there. We are sure we will find more enthusiastic kids. 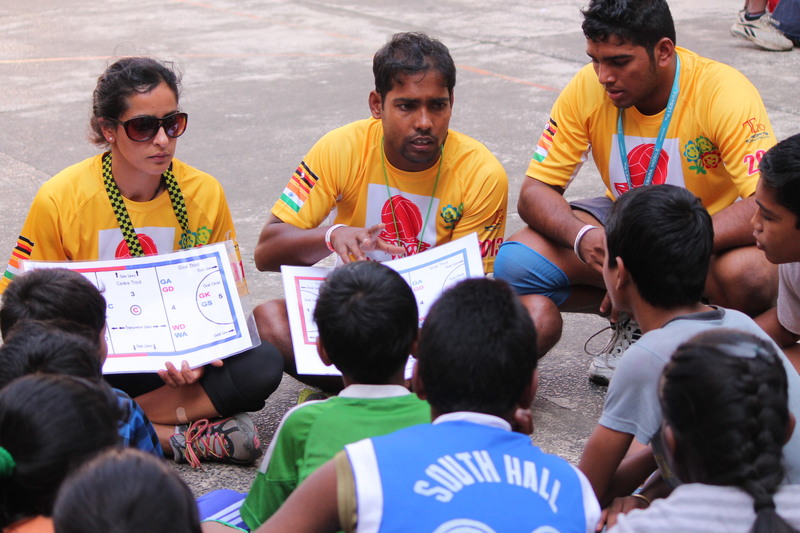 We already have Amirul and Sanu living in Siliguri who run the Khelo Rugby programme so they will now be able to add Netball to their coaching. So what is Khelo Netball? OK…People know about Khelo Rugby and the use of Tag Rugby to get the children playing, kids who do not have much and don’t really get the chance in sport. I think that to get kids involved in India it’s important to get the parents involved and parents usually do not like contact sport, specially for the girls. 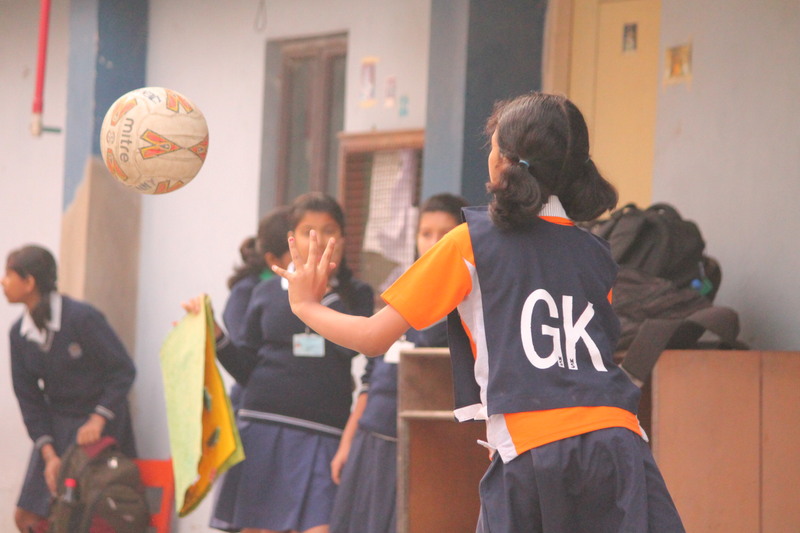 Hence Khelo Netball comes in, it is a non contact sport, can be easily played by girls only but can also be played in a mixed group. We do this in Khelo Rugby also but it might be easier to get this happening with Netball. And why not have a sport just for the girls, that would be nice. And why are you volunteering your time? I like what our Jungle Crows does…I do not earn much and life can be difficult but I understand that it is important to give time and your energy to the community. Hence I am willing to give up my few days of daily wages for a better cause. On the other hand it’s great fun to be with my friends…there is always some silly jokes around the corner to make me laugh and we do have some really good jokers in the team. We’re now looking to collaborate with more schools, organisations and communities to develop Netball at a grassroots level. We are always open to ideas and conversation. If you have a community and you think it deserves a smile give us a call and we can do something together! With Khelo Rugby bringing such great results bringing so many communities together and uplifting them we thought we would like to do something new, something fresh, something for the girls especially. We always believe in stretching ourselves and challenging our limits and capabilities and so we thought of taking up a game which was a bit out of our skill range but of course for a better cause and goal. So we have taken up the Netball challenge! This definitely meant we needed some professional help and that’s where The Netball Development Trust (NDT) come in. Their team led by founder Monica landed landed in Kolkata on Friday and got to work on Saturday with a first Coach the Coach session with a group of 20 Jungle Crows boys and girls. We are very excited that they are supporting the Jungle Crows Foundation in introducing the sport of netball to the kids we work with and also to some new schools in Kolkata and our new hunting ground, Siliguri. We’re starting out with mixed netball but we’ll look longer term to provide opportunities to play and compete just for girls. We now have a two week coaching programme to come and it will be divided between Kolkata and Siliguri. We already have four schools and two communities signed up in Kolkata and four schools in Siliguri. Our very own Mitra one of our coaches participating in the coaching session who is also a very handy rugby player said, “I like the sport, I have just spent an hour trying to learn it and looks good. We sometimes play rugby-netball so we know some of the basics but there are quite a few rules to learn. It’s great we have an all girls sport now“. Khelo Netball is looking forward to encouraging take up of the sport and seeing how we can use netball within our community programmes. Netball like our tag rugby is a very safe and generally non-contact sport and hence to gives us the bridge to take it forward with boys and girls playing together and delivering it in areas without good facilities and grounds. We are very excited to get netball started and we’re sure that we’ll find some twinkling new Netball stars in the future.